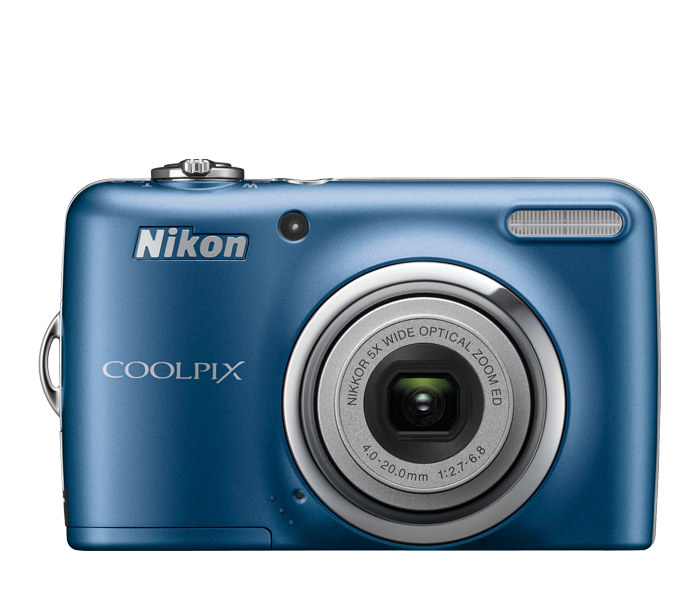 The new, fun COOLPIX L23 is an easy to use camera that will have you shooting beautiful images quickly. With Easy Auto Mode, you don't have to worry about a lot of settings. Just point and shoot—the camera automatically selects the optimum setting for your shot. Its Smart Portrait System features Smile Timer, which catches subjects the moment they smile; and Face-Priority AF, Nikon's face-finding technology that can find and focus up to 12 faces at once. With the COOLPIX L23, you're sure to get that great shot. Thanks to Blink Warning, you'll receive an alert when your subject may have blinked. And in-camera Red-Eye Fix automatically corrects the problem before it happens. Imagine having 17 Scene Modes—such as Portrait, Party, Landscape, and Sunset–-assuring great pictures shot after shot. Packed with features that make even challenging pictures easy to take, this shoot-smart camera uses a 5x wide-angle optical Zoom-NIKKOR glass lens for a zoom range of 28-140mm. And its telephoto lens can capture images in close detail, as close as 3.04-cm. Even more, the COOLPIX L23 can freeze the action without blurring the shot. This versatile camera uses three-way Electronic VR Image Stabilization to minimize the effects of camera shake for sharper, clearer images. Add to that the convenient Motion Detection, which identifies moving objects and adjusts both shutter speed and ISO to compensate—and you can relax knowing that your shots will be sure and steady. Your creativity is also assured by Best Shot Selector, which automatically fires off up to ten shots with one press of the shutter, then selects and saves the sharpest photo. The COOLPIX L23 also comes with a bright, clear 2.7-inch LCD with a five-level brightness adjustment. And even though it's ultra-light and compact, the COOLPIX L23 has a robust 10.1-megapixel CCD sensor that shoots brilliantly for prints as large as 16 x 20. It's so compact and attractively priced, it's easy to forget that the COOLPIX L23 is also a reliable performer that's incredibly convenient to use. Just slip it from your pocket, power it up, and in seconds you're capturing shot after brilliant shot. With three-way Electronic VR Image Stabilization, you don't have to worry about camera shake even when you're shooting one-handed—so you can freeze movement blur-free while on the go. And the COOLPIX L23 uses AA batteries, which not only support hours of effortless photo-taking fun, but are readily available anywhere, anytime. Compact, colourful, and convenient. It's pure COOLPIX! The COOLPIX L23 is as stylish as it is convenient. It's slim enough to slip into the pocket of your jeans or backpack, and can shoot virtually any photo op that life throws your way. Plus, it's lightweight, easy to hold design makes it perfect for single-handed operation. Whether you're shooting your family, friends, or classmates, this one camera does it all!